Our philosophy of not caging your pet all day long holds true for our feline guests as well. 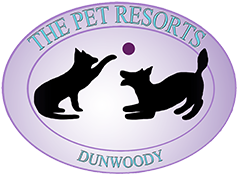 Even though each of our feline guests get their own private, 2 story Cat Condo with side portals into adjacent condos, we open up the doors allowing full access to our cat quarters on an individual basis. This area has scratching posts, cat trees, and cat toys to entertain and exercise your kitty. We also have a very large picture window with a perch area allowing a full view of all the activity in our lobby area. Convenient curbside check in and check out is also available for your cat.